What are Second Chance Draws? Who Can Play in Second Chance Draws? Are Second Chance Draws Worth It? Though it may feel like it, losing in the lottery isn’t the end of the world. But, if you’re in the right place and the right time, you could end up being a winner after buying a losing ticket in some lotteries. How? Read on to find out! 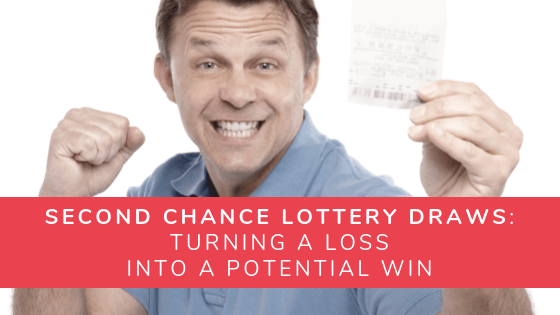 Second chance draws allow players to enter their losing lottery tickets into a new draw for another shot at winning. Typically, prizes range from as little as $500 to as much as $1,000,000—or more, depending on the lottery. Not all lotteries have second chance draws, and those that do can offer monetary prizes as well as brand-new cars, football tickets, gift cards, and vacation packages. Only losers are eligible to play! Each second chance draw differs between lotteries, but one thing is the same across the board: it’s for losers only! Okay, that sounds a tad harsh. But seriously, how many losing tickets and scratchers are littering your car or purse? We can’t all be like Jane Park, a young lottery winner who won a huge jackpot on her very first try at the age of 17. So, check out the lottery site where you bought your ticket for that second chance draw and check your trash for that ticket you threw out! The odds of winning in a second chance drawing can vary, depending on the program. This is mainly due to the fluctuating number of players. For example, the main game in an Oregon lottery scratcher offered a 1 in 120,000 chances of winning the $100,000 prize, but in the second chance game, the odds of winning the same amount were only 1 in 18,000—simply because only 18,000 people entered the draw. Second chance program mechanics differ per lottery. They range from entering your losing ticket online, mailing it in, or physically dropping it off at the lottery office. And some lotteries like the California State Lottery and the Massachusetts 2nd Chance offer mobile apps that allow players to scan the ticket, instead of manually entering them! But if you don’t live in these states, you are at a distinct disadvantage. This is when playing on the online lottery websites is a big plus! Some lotteries offer automatic second chance draws, like LottoLand, for example. The caveat is that some lottery sites only allow you to bet on the outcome of games, so if you prefer playing in official lotteries, you have to do your homework. Which Lotteries Offer Second Chances? Of the 44 states that hold lotteries, 43 lotteries offer second chance draws. Second chance promotions vary, and some state lotteries even offer multiple second chance draws. For example, California’s 2nd chance offerings include SuperLottoPlus, non-winning Scratchers and Fantasy 5. Second chance lottery draws aren’t as common in Europe as they are in the U.S. They exist but some have different sets rules as their U.S. counterparts. Australia’s biggest lottery operator, the Lott, offers the Scratch eClub, a second chance draw for players who own non-winning Scratch-It cards. Regular draws are held every month, while select players are automatically entered into separate special birthday draws. So far, this seems to be the only second chance drawing being offered in the country. Of course! Second chance draws offer losing tickets another shot at winning big prizes. You already paid for the ticket. Why not take that extra step to enter again?